My Mom had 2 blank cloth-bound journal books that she taped clipped recipes in. She also hand-wrote many, many more. She was a recipe collector just like me. Now that she is no longer with me, I look through her recipes often. She also had 2 recipe boxes that I cherish. This particular recipe I found one evening while I was trying to decide what to make with the chicken in my refrigerator. It sounded good, we love roasted vegetables, and I had all of the ingredients. Although I used all breasts because I had them, you could use thighs too. I wouldn’t suggest legs or wings as they may dry out before the vegetables were done. You could mix up the vegetables too. Try adding some onions or substituting sweet potatoes for the russet potatoes. This is such an easy recipe. Peel the carrots, chop. Wash the potatoes, no need to peel, chop. Mix, put in your baking dish, bake and enjoy! If you’re making this for a larger crowd, use 2 envelopes of the onion soup mix and 1/2 a cup of oil. In large bowl add soup mix, oil and garlic powder. Whisk until combined. Add remaining ingredients and toss to coat chicken and vegetables evenly. Empty chicken and vegetables into large roasting pan. Arrange chicken breast side up. Bake, uncovered, basting halfway through, 45 minutes or until chicken and vegetables are done. 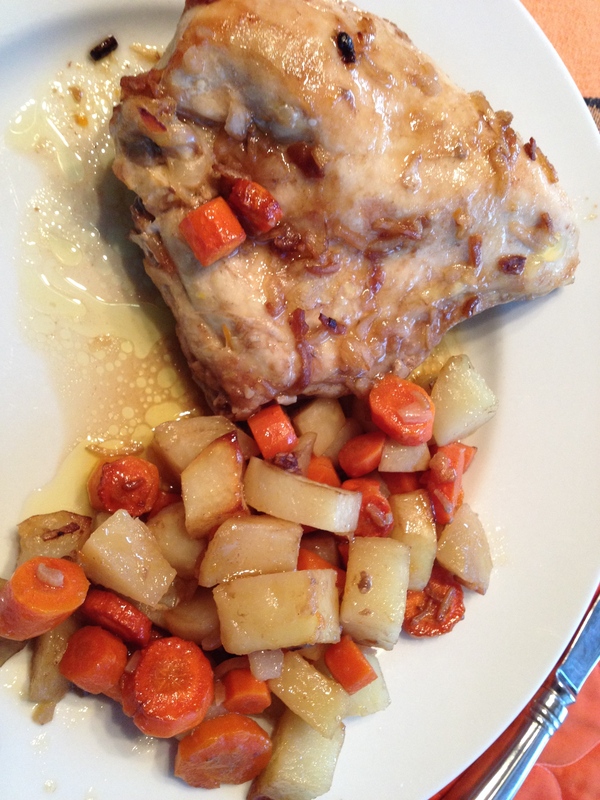 This entry was posted in Chicken, Comfort Food, Entrees, Sunday Dinner and tagged baked chicken, carrots, chicken and vegetables, onions, potatoes, roasted vegetables. Bookmark the permalink. Sounds delicious and very doable!